The Collaborative Economy enables people to get what they need from each other. Similarly, in nature, honeycombs are resilient structures that enable access, sharing, and growth of resources among a common group. Our latest version of the Honeycomb framework, Honeycomb 3.0, shows how the Collaborative Economy market has grown to include new applications in Reputation and Data, Worker Support, Mobility Services, and the Beauty Sector. 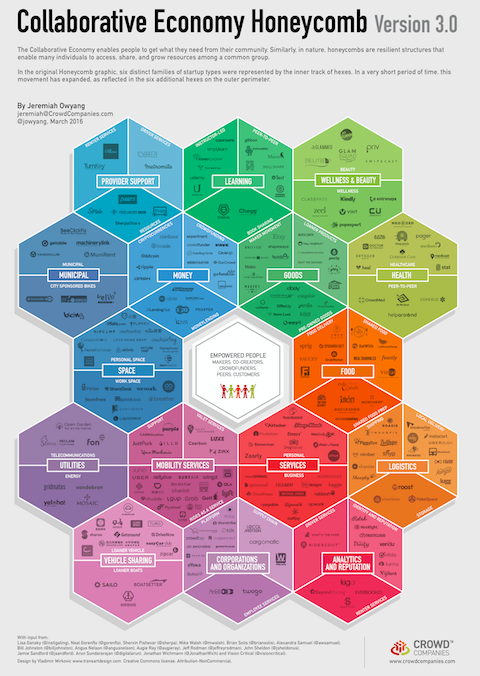 This is a market map to help you understand how every industry can benefit from the Collaborative Economy by partnering with new startups. Advance to the registration page, or click on the image below to see the larger version. Honeycomb 3.0 was a large undertaking. At least 460 startups were reviewed, and 280 were chosen to be included in Honeycomb 3.0. We researched and analyzed the impacts of new startups within the sharing economy since the publishing of Honeycomb 2.0 in December 2014 (and, before that, the original Honeycomb in May 2014). This time around, we specifically focused more on international startups, startups that are on the upswing, and those receiving a lot of funding. The goal was to take a current snapshot of the “A-list” companies in the space. Determining which startups to include required reviewing vendors included in previous Honeycomb versions, startups included in our funding spreadsheet, the overall market, and suggestions from our network. Each startup that was considered was evaluated separately for meeting sharing economy criteria, its relevance to the market, its function, and location. 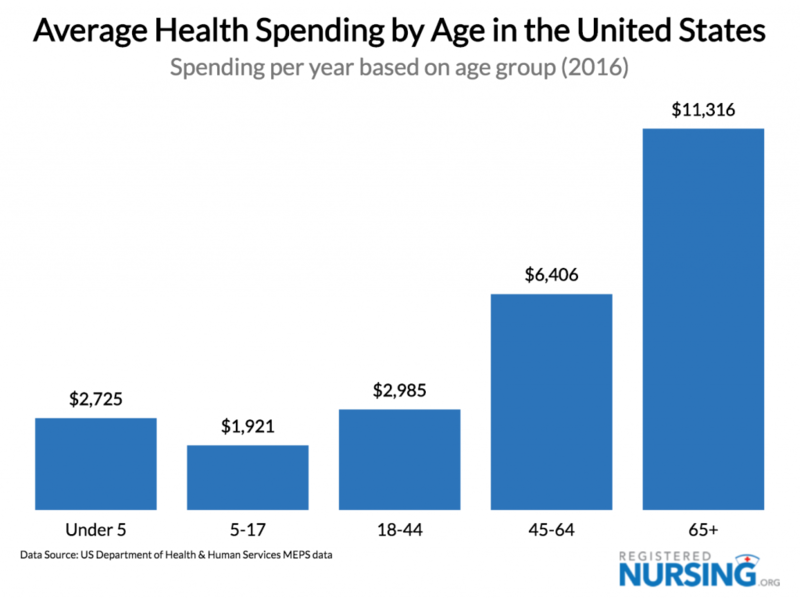 This process led to uncovering new trends in the sharing economy and establishing new categories, subcategories, and some re-organization of previously established categories. There was also some startups from previous Honeycomb versions that no longer exist or had been cannibalized, so they were removed. Honeycomb 3.0 is not intended to be a complete market picture, as there are thousands of other startups out there. We chose those that we found best met our criteria. You can use the blank template below to fashion your own version, too. 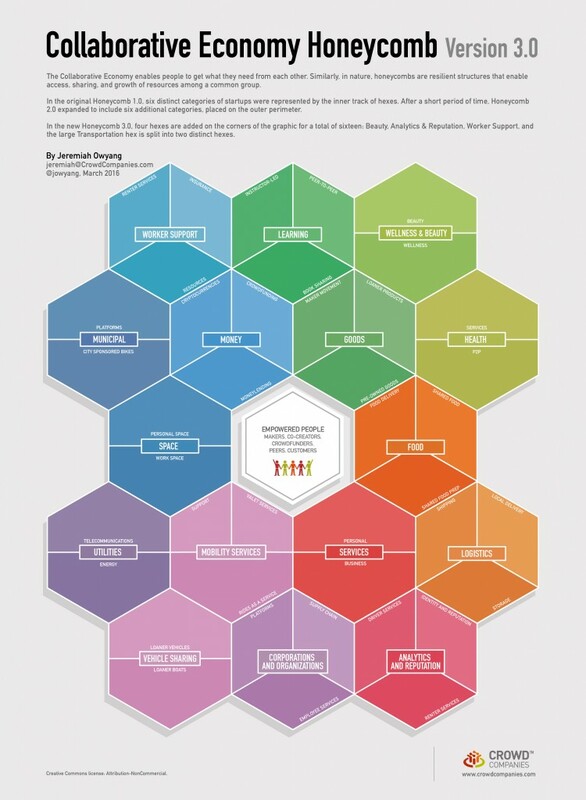 You can create your own honeycomb, for your specific region or industry sub-category, or simply one that’s focused on your view of the world. We’d love to share it, collaborate, and make this a resource for everyone. Excessive influx of startups in every industry. One of the findings is that there is a cambrian explosion of startups, caused by a few reasons: 1) Low cost to create startups in today’s software as a service and open source technology startup market 2) Influx of VC funding 3) A strong desire to solve the needs of sharing goods and services among people. Of course, this comes with a downside, as I see 5-15 startups in nearly every category, for examples a variation of car share ownership, shared car usage, shared car services and more being offered. Some startups seek to partner –or disrupt– corporations. There’s a handful of disruptive startups to corporations that are emerging, that I wanted to point out, in particular: Yerdle, which is founded by former Walmart executives, is designed to allow neighborhoods to share and gift products –rather than buy them. Relayride which has partnered with big players like GM and OnStar for distribution and access to vehicles with OnStar technology, and soon to emerge Feastly, which will enable pro-sumer chefs to enable their home kitchens to invite guests over to eat –disrupting restaurants. Expect many to die out –but VCs will fund accelerators who will likely succeed. So what does it mean? It means this large flood of startups means a hype market, and most will not stand the test of time. However those that receive rapid market adoption will be hunted by VCs for cash injection to further dominate their markets. 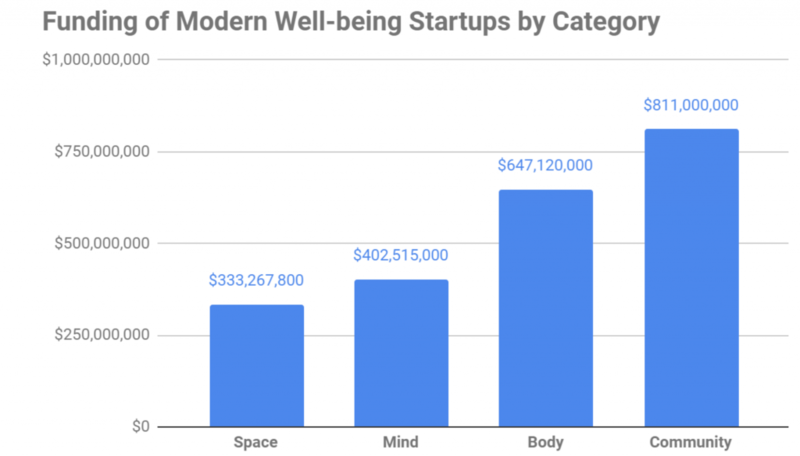 I interviewed many of the startups for this research, and must aren’t ready to partner with corporations, they intend to disrupt, in order to raise their profile, funding, and value. Expect corporations to be disrupted before they adopt, just like in most technology markets. Below, enjoy this infographic that summarizes just 200 of the thousands of sharing startups like AirBnb, Lyft, and a host of others, this data was taken from a list I compiled with the help of a Taskrabbit on this post here. We’ve segmented the startups by funding, use case, business model, and integration with social networking features. In 2013, Community Managers are trending, both online, and their impact to their organizations and the customers, who they serve. 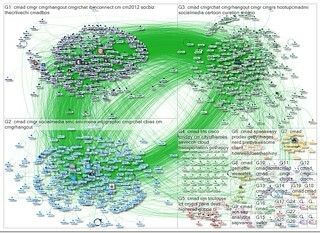 As professional online communicators, Community Managers are the most powerful group for 5 reasons: 1) Professionally trained 2) Access to top tools 3) Manage the largest social media accounts in world 4) Highly connected to each other, and 5) Their interactions with market are public, which resonate. 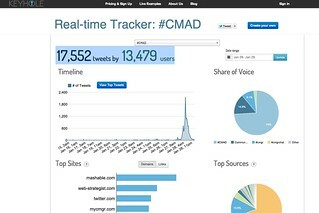 I’m pleased to report that yesterday, on Jan 28th the Community Manager Appreciation tag (#CMAD) became a Twitter trending topic in at least Finland, France, and United States for over five hours. Each year, Community Manager appreciation day grows in size and in location, this year I was stunned by the community involvement and market reaction. I heard comments that while in emerging markets there’s still justification required for the role, but within US, there’s already wide understanding and approval of this role within today’s modern company, both big and small. Last night, at the SF meetup whether or not CMs were the final decision maker for social tools and software, and depending on size of company, it could vary, however they often short-list the social business toolset for management and teams to analyze. While they often need to work with the Corporate Social Strategist, they’re internal influencers on how programs role out. Next year, in 2014, Community Manager Appreciation Day will be on Monday, Jan 27th. (It’s on the fourth monday, every Jan). We will discuss this year what the theme will be –beyond appreciation. While some markets still need awareness and justification of the role, developed markets are seeking to push the agenda and be forward moving. We’ll find a theme, announce it in Dec, and ask the industry to collectively move forward. It goes without saying, that appreciation doesn’t stop, but now that we’ve collectively raised awareness, let’s advance as one. Here’s a wrap up of all the events that happened around the globe, and analysis on the online impact, from a number of social analytics tools. Please leave a note or URL in the comments, and I’ll update it. A number of social analytics firms are running reports, I’ll cross link to all analysis and capture highlights here, it’s interesting to see the common data points and look at averages points and trends. It’s interesting that the various tools have roughly the same data frequency count. 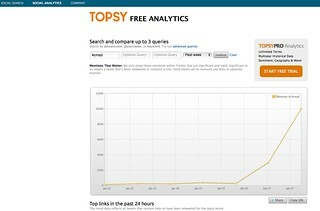 Topsy (report) 10,004 Mentions, thanks Rich Schwerin for the URL. Can’t leave date range, so this report may phase out over time. Salesforce Marketing Cloud (slides, also embedded below) 24,000 conversations, most on Twitter, in English followed by Spanish Interesting how dominate Twitter is over FB and Blogs. There were multiple physical locations spanning SF, Boston, Atlanta, Austin, Tokyo, France, Finland, and beyond, it’s difficult to track them all. Of course, some CMs get their desks decorated, or cupcakes, flowers. French: Blog dumoderateur shares the genesis of this event. French: the world of Community Managers in action. Voices of Community Managers, and Shout Outs! 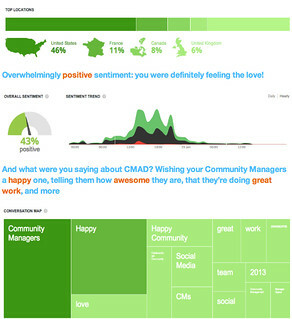 Uservoice has several clever CMAD cards. Ironic empathy makes me feel ok. Please leave a comment below of any coverage I missed, I’ll add. Marketers, have you ever been in an agency pitch that focuses on the tool and channel and forgets about content? Or, from the other side of the table, have you ever had a client on the brand side ask you for your Twitter/FacebookPinterest strategy –but doesn’t have anything meaningful to say? Our industry is afflicted with shiny object syndrome, a focus on the new tools, without thinking about the content that will drive it. As we mature and the tools make it easier to share information, companies need to be extra sensitive to the content that will be shared, both that’s created by the brand, and the customer. Visual information reigns supreme, from video to images to infographics. Mobile and location-based marketing are the second most-cited area into which marketers want to expand content initiatives. Bright, shiny objects, i.e. a fixation on newer channels and technologies, can distract from foundational channels, e.g. search, written content, such as blogs, and educational content, which is often essential in B2B channels. Budgets must increase to accommodate content channels such as video and mobile that require larger production and development investment. Marketers’ confidence in and reliance of content marketing is beginning to diminish their reliance on print and broadcast advertising, as well as public relations. 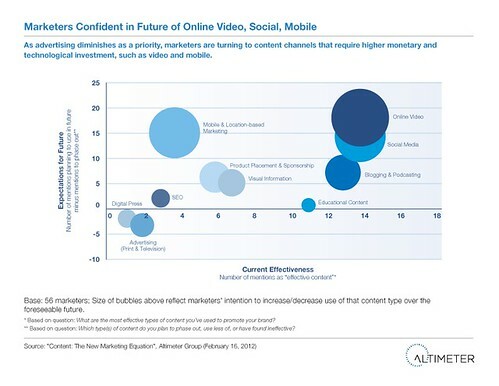 Marketers Confident in Future of Online Video, Social, MobileWhat does the future hold? This report offers an interesting aspiration state (Although the Red Bull case study shows some companies are doing this now) that companies who mature in this space can actually monetize their content –even if they’re not a media company. That’s right, even companies that sell soft drinks can build a lifestyle culture around their brand, and monetize the content created by their own community. This is perhaps one of the most powerful promises ever to marketers, to convert the perception of being a ‘cost center’ to a real profit center by developing a strategic content marketing plan. Open Research: Use it, Share it, and We’ll Create More. To learn more how companies will achieve this, read the report in the embed below. 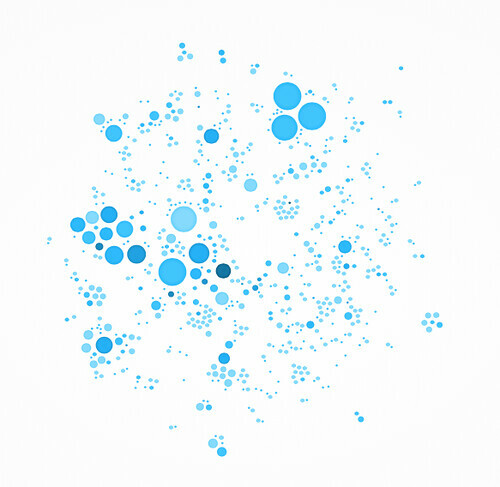 We look forward to your feedback as we track how content spreads across multiple tools, channels and mediums.